My great-grandfather, Marcos Burgos Santiago, died at the age of ninety-nine. His funeral, as my cousin Denise recalled, was larger than life. It seemed as if the entire town came to pay their respects to the oldest man they knew. He had never lived anywhere else but in Juncos, Puerto Rico, in the same barrio, just like his parents before him. His house, once made up of dirt floors and a tin roof, now serves a new generation of family residing comfortably behind concrete walls. 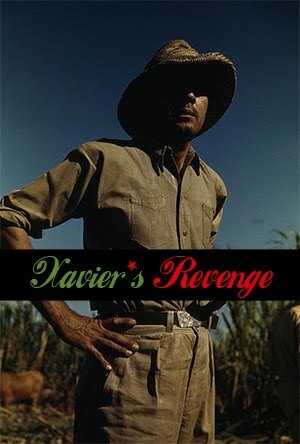 I remember still how he would show me, with pride, a missing part of his finger, chopped off from a machete while he worked harvesting sugarcane. In a way, he was showcasing how much the land was bounded to him and the extent to which it left its mark. Though he lived what many would call a long and full life, one thing haunts me. Born at the turn of the 20th century, Don Marcos resided completely under the rule of the United States. Almost one hundred years of life, and he never knew what it meant to live in freedom. He knew love, being married to my great-grandmother for nearly seventy years. He knew pain, having comforted his six-year-old daughter, as she lay on her death bed, waiting for his return from the fields so as to pass finally into oblivion. But not freedom. Even worse, nor did his parents, who lived under Spanish rule, or their parents before them. Five-hundred-years have passed, and Puerto Rico remains a colony, property of another country with a government that does not nor is expected to have our interests or our feelings in mind. Even the most ardent pro-statehooder acknowledges this. The same for some populares, if you catch them in a bar on a warm Saturday evening. Five. Hundred. Years. There was more for Don Marcos to care about, of course, than some nebulous and abstract concepts like freedom, self-determination, and a representative democracy that shares a stage among a league of nations. He had to feed his family (made increasingly difficult by the guzzling-up of arable land by corporate greed that transformed the island into a sugar monopoly). He had to ensure a formal education for his children (who were taught that Spanish was a primitive language and that their forefather was George Washington). His severed finger was a life-long indicator of his endurance and hard-work. But such a scar dug deeper than it appeared to. It cloaked the entire island. The ugly and disgusting scar of colonialism. Like millions of others, Don Marcos’ son left the barrio for the fields of New Jersey and then to the decaying Chicago metropolis, to make a new life with his wife and children. None ever returned to live among the yellow flamboyant trees and probably never will. But we should shed no more tears. Although the island is of a far spatial and temporal distance, it is an undeniable spiritual center of our existence. Our beloved Zion. However, we have not only extended the boundaries of an ethno-cultural nation located on the island, but in some ways, constructed a parallel national experience. It is too difficult for those, like Don Marcos, who never left, to fully and deeply connect with the poetry of Pedro Pietri, or the prose of Nicholasa Mohr, or some of the plays of Jose Rivera. We are diaspora people with our own distinctiveness. More importantly, we inhabit lands that we call our own. 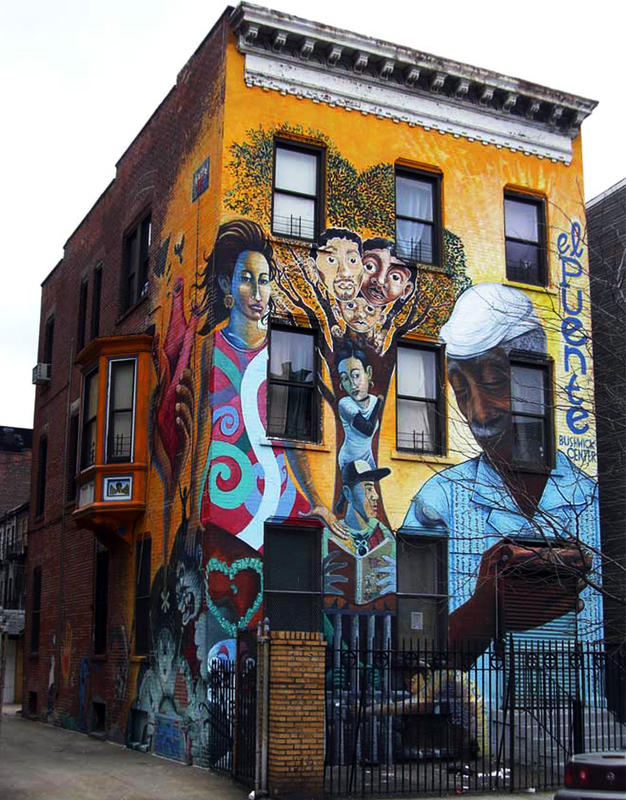 A little over a month ago, I asked a close friend to explore with me the Puerto Rican communities of Williamsburg and Bushwick in Brooklyn, places like El Barrio in Manhattan, where her own grandparents migrated to. As we traveled through locations with street signs marking “Avenue of Puerto Rico” and “Borinquen Place,” we soon realized that the eroding murals depicting urban jibaros and palm trees spoke to a Golden Age long dislodged from reality. With the exception of a few cars blasting reggaeton and rows of housing projects that reflect our state-sponsored ghettoization, this side of Brooklyn was visibly absent of a once bustling Puerto Rican enclave. Although the street was teeming with young, white “hipsters” visiting store-front art galleries, it was as if we were metaphysically stranded in a desert. The life we were seeking did not exist but in our memories, so nothing around us stimulated our senses. We longed for a place we could call home. Mari and I both have homes, though, and in historic Puerto Rican communities too; the South Bronx and Humboldt Park, respectively. Just as my family could travel outside of their small town and experience the landscape of their nation, the possibility also exists in the diaspora. Similar to the Black, Chicana/o, and Native American experiences, while we have settled in clusters in diverse and disparate areas throughout the U.S., we have an opportunity to witness our communities and to share our histories and struggles. This is how we develop(ed) a collective identity and potentially find a forum from which we seek solutions to our ills. Moreover, such a dynamic expands the “va y ven” paradigm that conceptualizes a multi-linear route between U.S. cities and towns towards and from the island. I propose to you that there simultaneously exists, especially in settlement and occupation patterns, a movement between the diaspora enclaves. Unfortunately, not so much in terms of dialogue and community-building efforts. Many times we speak of “our people” as some amorphous tangled body living in the air. Though we are not all inhabiting rigid geographic areas, there are numerous locations, such as in Newark, Orlando, Philadelphia, and Chicago, where we have constructed community for generations; where our artistic and political expressions have blossomed. The areas, oftentimes left to us in disarray, have also been loci of a decolonization process, because in them we have exhibited what was denied to us on the island, denied from Don Marcos: self-determination. But colonialism stalks us wherever we lay our feet, this time in the form of gentrification that rips away the freedom for self-definition and self-reliance. We must begin then to imagine ourselves as conducting a distinct national experience rooted, like my great-grandfather’s hands, in land. Subsequently, we will realize our immense responsibility to each other in composing a country-wide challenge to the most alarming and destructive force facing us today. In other words, displacement in Graham Avenue in Bushwhick should be just as important to Clark Avenue in Cleveland or Park Street in Hartford, because they all inhabit a vast Boricuascape. Without such a vision and action-plan, our descendants too may lament over a burden that should have been kept from them long ago. Originally published in the February 2012 editions of La Voz del Paseo Boricua and Gozamos. Envision, for a moment, a soundless and barren urban landscape, encroached on by a harrowing, opaque sky and bright, white snow mystically descending from the heavens, with only dim street lights to guide a path. Your awe-struck eyes gaze upon the overwhelming swarm of small, cold particles engulfing the air, swirling with the wind in a synchronized, rhythmic movement, rapidly melting on sun-burnt skin. Finally, your mind collides with the cognizance that this shall be the eternal home of lineages unrealized and that Puerto Rico is a land of no return. What a sorrowful and beautiful genesis to a narrative laid before us; the setting of the stage of an epic and incomparable tale of tragedy and greatness unforeseen. Such was the experience of thousands of pioneras/os, like my grandmother, who endured a particular migration decades ago; there were many before and many after them. In whatever time we locate the conception of a diaspora that owes its existence to a U.S. government-sponsored colonial enterprise, we must descry the fact that subsequent generations, physically distant from the island, continue to identify as Boricua. Some merely say that one can still be Puerto Rican even if residing outside Puerto Rico, as if the island is lending us magical keys to a locket of authenticity. In many ways, to be Puerto Rican is to be a part of our diaspora. In other words, there is a distinctive Puerto Ricanness in the U.S. and the island is just one (important) piece in a complex and colorful mosaic of cultural ruptures and innovations. Unfortunately, our communities are burdened with institutions, artisans, and educators who make it a point to extract the political from the cultural. Puerto Rican cultural consciousness is inextricable from the political. When the dwellers of the island and the diaspora began to understand themselves and their cultural productions as distinctively, unmistakably, and uniquely Boricua, they simultaneously understood, due to a subordinate sociopolitical status, the danger in making such claims. 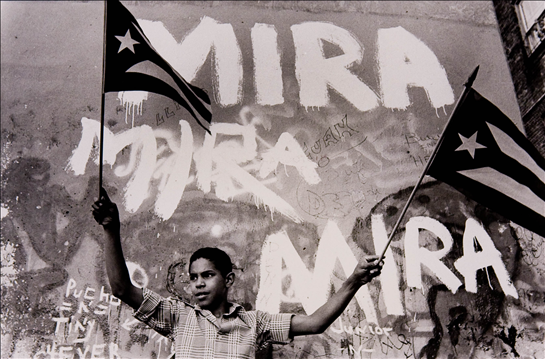 In essence, Puerto Rican culture and identity is a product of resistance. Thus, to be proudly Boricua, is to be solemnly defiant. To affirm apuertorriqueñidad is to thwart the processes that seek our destruction. But, many of our institutions, artisans, and educators present the world with sanitized, nostalgic, and island-centered artistic representations detached from our lived experience in the U.S. Most, but not all, contemporary art by the Puerto Rican Diaspora is thus without purpose or direction. Yes, there are many possible routes and trajectories, but one thing must be clear: there needs to be a aesthetic attached to an ongoing process to cultivate a non-assimilationist, diaspora-specific, solution-proposing, and culturally affirming agenda. In order for it to be meaningful, this aesthetic, utilizing photography, painting, literature, poetry, film, theater, sculpture, music, dance, and song, must be by and for our people and rooted in our communities (both historic and new). If we construct a New Boricua Diaspora aesthetic we can, with greater clarity, understand who we are and map out possible directions. Quite simply and unequivocally, we can begin to recognize and honor our beauty, particularities, and greatness and heal wounds of self-hate and cynicism. This, for what it is worth, is an invitation to dialogue and to create. Who shall heed the call? Whose art will proclaim, “Behold, the Boricua Diaspora, in all its lamentations, in all its glory”? We are from “allá afuera.” As such, we inhabit a nebulous and intangible world in the imagination of those who have not trekked beyond their Caribbean waters (and in even those who have). It is as if, in the insular colonial imagery, we dwell upon the heavens, sitting on top fragile clouds or lurking behind the stars, out of touch with humanity. But celestial beings we are not. Our existence, on Earth, is obscured. We are deemed a throw-away people, cultural pollutants, who were never suppose to return, never to witness the island of our forebearers. “Tú no eres Boricua” can be the most spiteful slander an islander can bestow upon us, not so much because of an innate insecurity, but the acknowledgment of our difference. According to the 2010 United States census, there are, for the first time in our history, more Puerto Ricans living in the U.S. than on the island; 4.6 million to 3.7 million to be exact. As time continues, less and less the children of Borinquen reside on our tragic Eden, despite the conviction that it remains our communal ‘home.’ The question why is important, but what characterizes our exiled existence as a hint to new collective directions is even more intriguing. As stated by Boricua theorist Juan Flores, the root definition of Diaspora means a “scattering or of sowing seeds (-sperien) across space (dia-)”, a suitable metaphor for the construction of Puerto Rican enclaves; from a minute bud to a growing vine germinating nuances in identity and community-building. For Flores, a Diaspora is not just about people moving to a new place, but the unraveling of a consciousness about the place they are in and the place they left. In the aftermath of the first Great Migration of the late 1940s to early 1960s, we forged emblems of our “inherited cultural backgrounds” in institutions, cultural festivities, literature, music, and political organizations, but with a palette of distinct “ruptures and innovations” detailing, exalting, and even lamenting our cultural aberration from those on the island. Like that of nations, our community is imagined, because although we could never know all the members of such a disparate Diaspora, it is a communion in which our connection is internally recognized and a camaraderie eternally yearned for. With controversial origins and often critiqued markers like ‘Chi-Rican’ or ‘Nuyorican’, we are united by a reference point and a new location, but of also disturbing social ills. As an au courant exodus out of our island unfolds before our tired eyes, we continue to face high levels of poverty and low levels of formal education, exacerbated by the destruction and displacement of our historic centers and a psyche of inferiority. 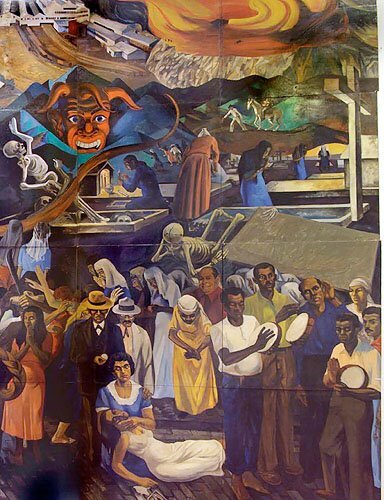 Moreover, the cultural and political institutions we have created throughout the decades are decaying because there are those among us who submit to the pressure to homogenize our experiences and unique historical memories under a “latino umbrella” and thus render any affirmed puertorriqueñidad as taboo and separatist. And even worse, those of us who obtain any sort of money or education, leave our life-centers, detach and disassociate themselves from ‘those in the ghetto’ and produce offspring with a sort of Du Boisian triple-consciousness – never accepted by a racist world and never truly accepted by one’s own people on both sides of the Atlantic. We are here, but less cohesive and pronounced, persistently misrepresented and misunderstood by the islander, the greater U.S. society, and by some in our flock. The leaking faucet of our tropical kin continues to flow and detrimental social forces endure in a masquerade around our unmarked tombstones. We are at the crossroads of possibilities stretching from a path of great historical and resilient contemporary feats, but jointly, across the cities and towns of our presence, something is lacking, the earth-shattering urgency remains nonexistent. With the effort of producing and amplifying safe spaces of in-depth dialogue on such socio-political conundrums and subsequently courses of direct action, can we approach the horizon with a profoundly inspiring, renewed, and reinvigorated vision for our people in the Diaspora. But the challenge has so few recruits while any semblance of our existence continues to erode. We are full of possibilities, but in a deep slumber we continue to lay. 1. Laviera, Tato. (1992). my graduation speech. la carreta made a u-turn (pp. 17). Houston: Arte Público Press. 3. Flores, Juan. (2009). The Diaspora Strikes Back: Caribeño Tales of Learning and Turning (pp. 16-17). New York: Taylor & Francis Group. 5. Anderson, Benedict (2006). Imagined Communities. New York: Verso. 6. Du Bois. W.E.B. (1903). Of Our Spiritual Strivings. In The Souls of Black Folk. The Health Anthology of American Literature: Volume D Modern Period 1910-1945 (pp. 897-902). Boston: Houghton Mifflin Company.